Ridley Scott is one of the most ambitious film makers of our time, he is closing in on eighty years old, but like Clint Eastwood, he continues to prove that he still has it. This is a smart, big screen entertainment with a good mix of drama and humor and a well realized visual environment in which to play. As a consequence, this film should be a smash, coming as it does at the end of a long stretch of mediocrity in the cinema year. 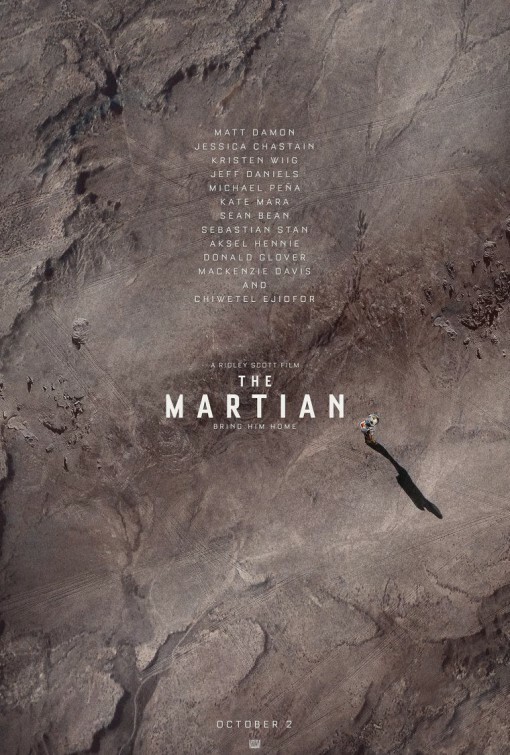 A combination of “Cast Away”, “Apollo Thirteen” and “Macgyver”, “the Martian” tells the story of an astronaut abandoned accidentally on the surface of Mars, and the effort that he and others make to try to bring him home. It is heroic in the sense that an individual facing incredible odds, continues to strive to live, but it is equally heroic to think of the sacrifices and efforts made by a litany of others who would bend heaven and Earth to help him. 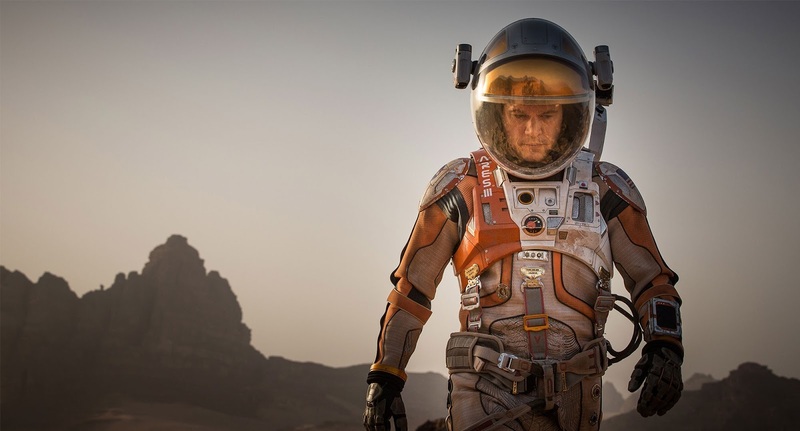 The complexities of a journey to Mars are outlined in the continuing series of crises that Matt Damon’s character has to face. Basic survival requires ingenuity that would challenge the wisest of us, but driven by hope and an indefatigable will to live, a smart guy manages to find ways. From a storytelling perspective it works really well. As a slice of imagined reality, it squeezes by on some convenient fictionalized story points. If “Gravity” got criticized for playing fast and loose with some aspects of physics, then this movie should end up in a jailcell right next door. The truth is that story is more important than physics when it comes to cinema, and the theme of hope trumps all. Most of the plot that takes place on Earth and on Mars, feels real. There are political considerations and bureaucratic power issues at home that spice up the dilemma on Mars. A solid cast of actors makes the NASA organization recognizable to anyone who has worked in a large environment. Government regulations on transparency complicate the problem solving on Earth, but allow a decision to exclude the crew of the expedition vessel from some of the early events in the film. Fortunately, Matt Damon, looking like Leo in the upcoming film “The Revenant” manages to inject enough humor and personality into the story to keep us interested. The talking and planning and arguing that takes place at home plays second fiddle to the adventure on the red planet. I will say however, that it was an amusing touch to have “The Lord of the Rings” referenced while “Boromir” was sitting right at the table. The one place where the movie does not quite fill it’s potential is in the main ship and crew that left their colleague behind. They are cut out of the story for a big chunk of time and then when they are brought back into it, the answers to problems that were at least a struggle for Damon’s character, get resolved a little too quickly with some of the same scientific hocus pocus that would fix a problem in “Star Trek”. By the end of the film, we can live with that as well because the movie really is a little long. The visuals on the ship are fun to look at but never seem as real at those on the surface of the planet. The jokes about the music selection available suggests that in the future, we have less technology available for an app than an ipod from 204 had. These are minor quibbles but the film is strong enough to overcome some of that. A whole planet comes together in a way that we would hope it would with a situation like this. International cooperation might be expected but this might be a fantasy as well. If it is too fantastic to believe, it’s still inspiring to fantasize about. Duct tape and the human heart can overcome almost any obstacle, and that feels true, even when the science says it is not. My favorite novel of 2014 received a fantastic treatment to film…or digital cinema…whatever. Saw this at the new Playa Vista Cinemark, on their XD (IMAX-like) big screen. I swear, some of the scenes reminded me of ‘Lawrence of Arabia’ it their use of vistas. Easily, one of my favorites of the year.